Hong Kong Wetland Park the official version. HK Wetland Park A more critical appraisal which would have benefited hugely from some sub-editing…jeepers, Martin, call yourself a writer?! There’s an interesting introduction to the Wikipedia article about HK’s Wetland Park, it says “It was to be an ecological mitigation area (EMA) for the wetlands lost due to Tin Shui Wai New Town development.” [emphasis added] An interesting choice of phrase. I worked for a consultancy that conceived of the wetland mitigation area which was intended to clean up the pollution from the NWNT that flowed into the Inner Deep Bay Ramsar Wetland of International Importance. The pollutants (from HK, setting aside the open sewer from Shenzhen, see elsewhere) included effluent from intensive pig and poultry farming, industrial effluent and increasing road traffic run-off. 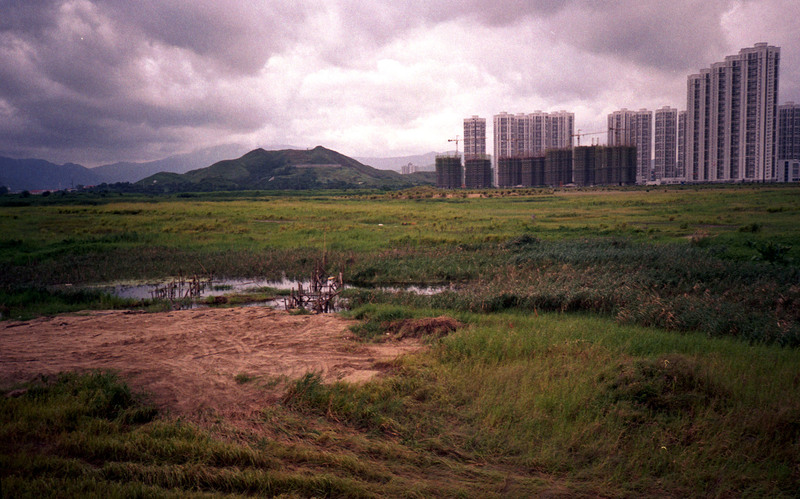 In short, the ecological value of Inner Deep Bay was being swamped with pollutants. 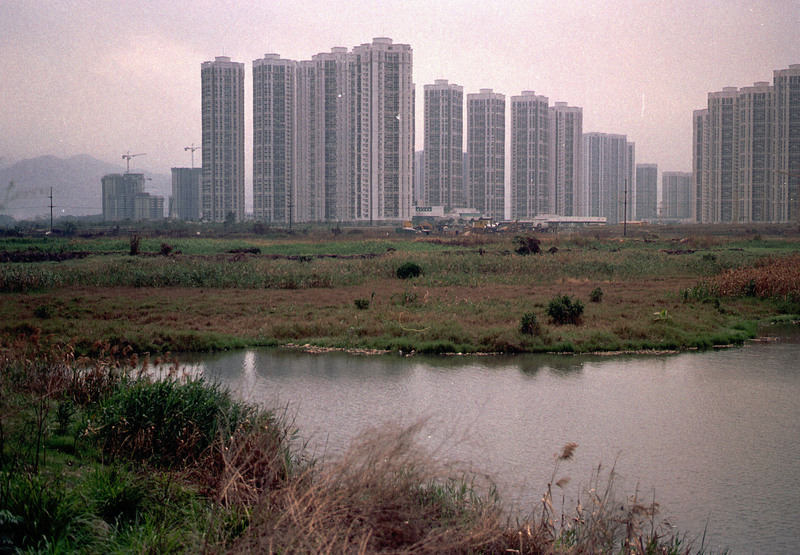 The rivers flowing either side of the Tin Shui Wai ‘reserve zone’ were black, smelly and toxic. What was the reserve zone? 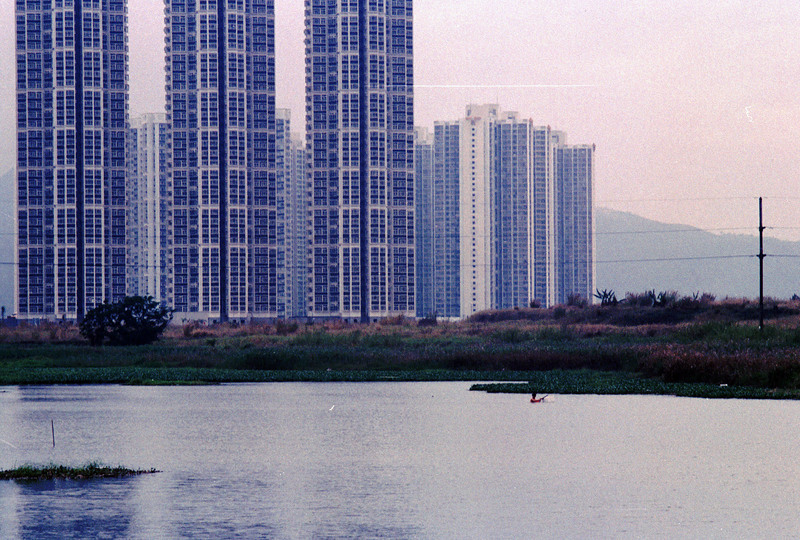 Tin Shui Wai before it became a depressing new town was a large expanse of manmade, tidal fishponds and geiwai (shrimp ponds). 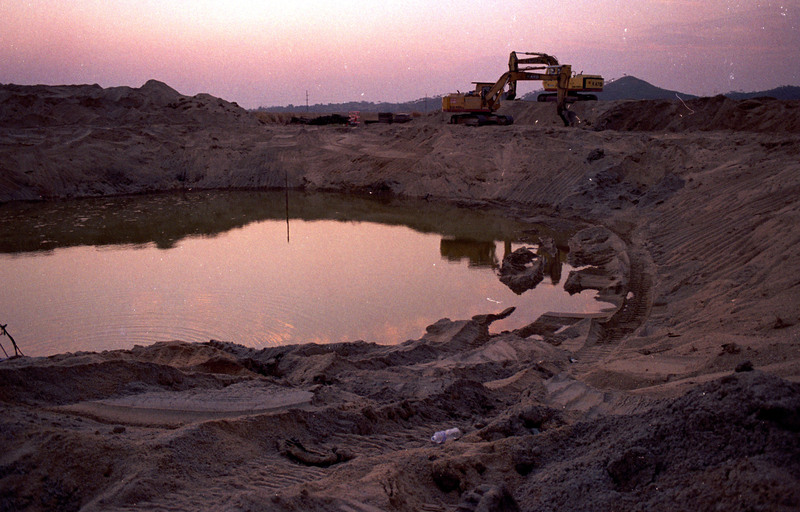 Some time in the late 1980s an ecologically challenged consortium hatched the idea of filling the ponds with seabed sand and building a housing sink. The northern edge of TSW pond filling and the fishpond habitat that preceded the concrete canyons. Metres of sand were pumped in and allowed to settle into the soft muddy ponds…for several years to allow consolidation. How much sand was pumped into the ponds? This much sand. Dig down 5m in Tin Shui Wai and you’ll be below sea level. With the onset of ‘global warming’, TSW will be the new Venice…maybe. 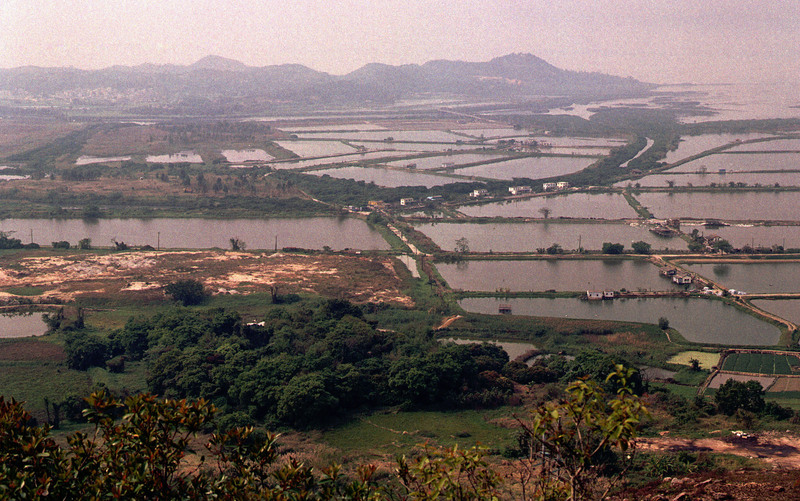 While the international experts did some serious ecological baseline studies, no one was looking at the project brief which was to compensate not for the loss of the original fishponds as they’d been filled years before there was any requirement to compensate the habitat loss, but to compensate for the loss of wetland habitat in the newly formed reserve zone…the place now metres deep in seabed sand. 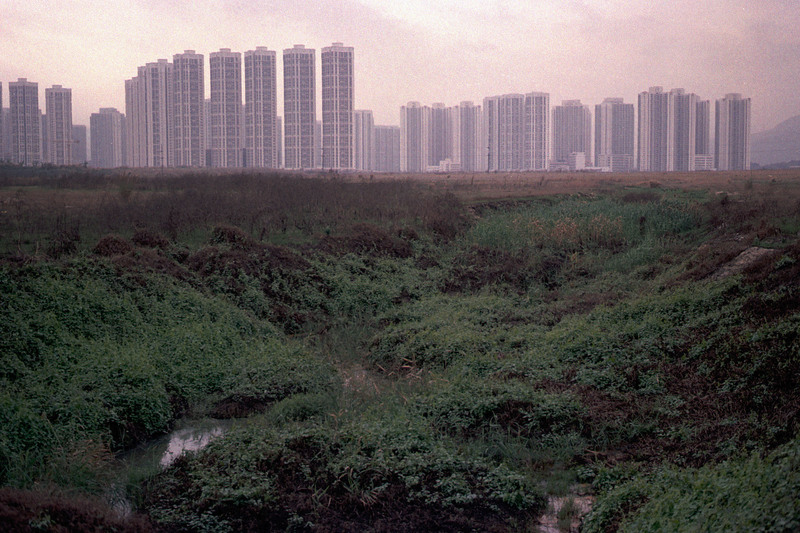 And the rules of compensation are “like-for-like”, in other words, to prevent smarmy developers from compensating lost ecological habitat with a bit of concrete park with planters, the legislation stated that you could only create wetland if wetland was being lost. Our experts had been looking in the wrong place! While earnestly seeking to put a stop to degradation of the offsite valuable habitat, they’d not been looking for a reason for mitigation. The reserve zone had been jokingly dismissed in one of our initial reports as as a ‘desert’ (lots of sand, geddit?). This included a full page colour photo of the reserve zone with yellow sand stretching off into the distance. How did a team of professional environmental scientists dismiss the habitat so lightly and miss the wetlands? Only one scientist looked at the reserve zone, he was a physicist and mathematician not an ecologist and he was actually looking for an apartment to invest in in the development zone; not out conducting a survey. From the window of his prospective investment, he took a photo of the view during the dry season. 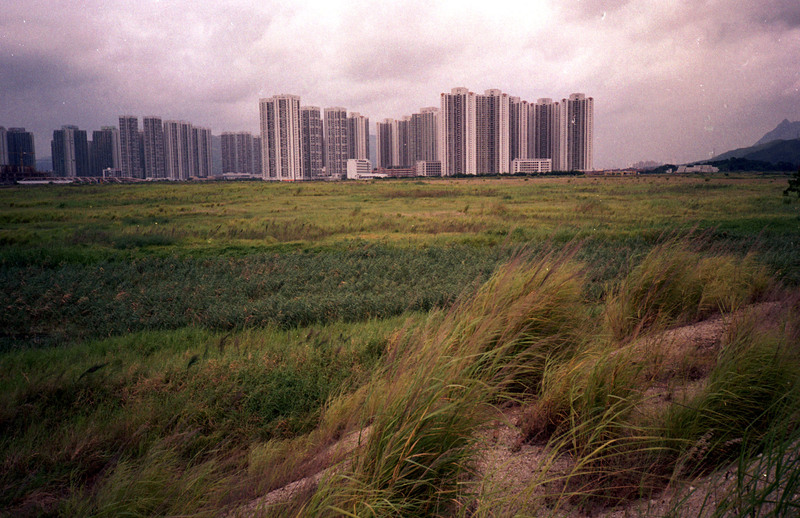 That chance real estate photo was adopted by the consultancy as an expedient ecological survey of the reserve zone and used to prove that there was no ecological value. I came into the project having just concluded my first post-graduate year as an assistant environmental scientist, and despite being grateful for the opportunity I’d become bored with being tasked with providing mostly secretarial support to the tenured team members. I was ready to move on, but the after-hours ecological work I’d done (for no pay, often at weekends) had been recognised and I was given an open brief to take a few days to wander all over the Tin Shui Wai and Lau Fau Shan area and give it an appraisal through a fresh pair of eyes. My ‘report’ caused a bit of a stir as I said that there was ecological value in the middle of the reserve zone in the form of an extensive wetland – in the ‘desert’! And I had photos of reedbeds, herons, egrets and other waterbirds to prove it. A reedbed in the foreground with the ‘development zone’ to the south in the background. Not quite a ‘desert, then. An extensive area of very wet reed beds. Not something you’d want to wade through without waterproofs. As I said earlier, my photos and opinion were not universally welcomed. First, we met internal opposition from our paymasters, the engineers, who were not happy to hear that their ‘reserve zone’ sandpit due to feature roads, infrastructure and 20+ storey housing suddenly had ecological value. This caused problems on several levels: it revealed that the fill material hadn’t properly consolidated evenly across the reserve zone; and, that engineers hadn’t been aware of the fact; they also possibly faced delays to the their programme if ecological evaluation was now probable and being engineers, this was something they just didn’t understand; there was also the issue that the previous approved and accepted report had dismissed the area as a desert and now was going to reverse its opinion. This was potentially embarrassing for the paymasters, their client, the reviewing government departments etc. etc. and losses of face all round. So a good thing for the environment, becomes a bad thing for suited egos. Thankfully, EPD were keen to press the issue of mitigation (at the time, AFD had no remit for conservation) and insisted (against the wishes of the Territorial Development Department – the client – and our very reluctant engineers) that the desert description of the reserve zone was revisited and amended. Some clever words were used to describe the seasonal ‘oxbow rivers’ as previously dry and therefore having been missed and a reason for wetland mitigation was discovered. Our engineering project manager was not at all happy as his budget now had to account for additional survey work and mitigation design. From that moment forward, he micromanaged the environmental work, questioning ecological statements in every report. By the time the engineers got out to site, the project manager had become a project director. The wetland design had advanced from a conceptual water-clean-up wetland, to incorporate some additional ecological benefits and some overseas specialist wetland expertise had been brought in to beef up the thin local experience. 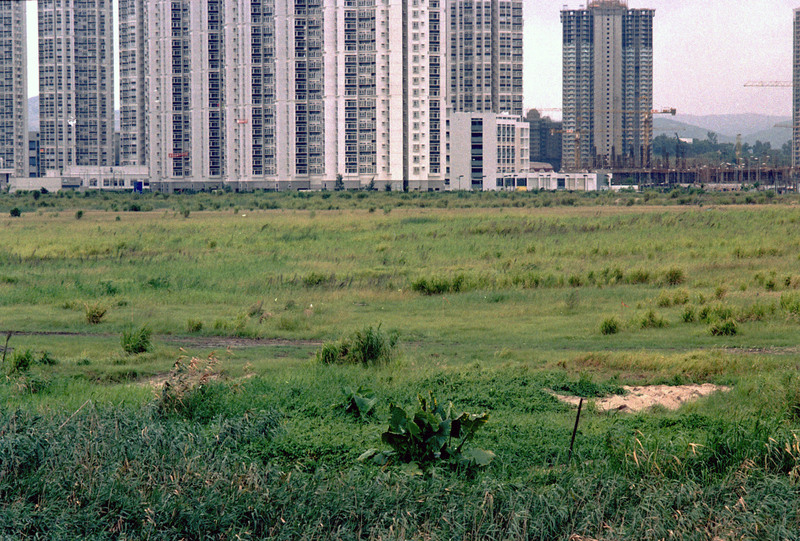 Landscapers and the Wetlands and Wildlife Trust (UK) displaced our consultancy staff, many of whom moved out of Hong Kong around the time of the Handover. Being busy on several other projects, I had little to do with the project for 3-4 years apart from getting phone calls from a friendly site engineer asking me to clarify whether what was happening on site was part of the design. Even with no experience and not being responsible for the work, he could see that things didn’t look right. There was no one with ecological expertise on site overseeing the building of the wetland. The bathymetry of the pond area was excavated with bulldozers and scales were out by several factors because the engineers didn’t understand the point of the exercise and didn’t want environmental scientists meddling in their sandpit. Eventually, the contours of the pond were remedied at additional cost. During the intervening years, ecological monitoring off Inner Deep Bay took place, but not of the reserve zone construction site. Independent ecologists from another consultancy were tasked to survey birds, mud skippers, crabs and mudworms from the flats to detect offsite impacts. Surveying took place over the period of a week per month checking coastal sites off Lau Fau Shan, the mouth of the Eastern Channel and Mai Po Nature Reserve. Reports were submitted with equal frequency to regulatory authorities for comment and action if impacts were detected. Eventually, somebody checked the work of the independent ecologists and found it wanting in quality. The work had been subbed out by the consultant and ended up in the hands of non ecologists who hadn’t a clue what they were looking at, or doing. Another consultant was called in to take over the work and stuck at if for several months before leaving Hong Kong. Before starting, he insisted in reviewing the work of the previous incumbents and raised alarm about the state of the reported information. He amended the standard operating procedures as he considered some of them dangerous or just pointless. In other words, after several years, someone took the trouble to review the whole process and see what worked, what was useful and what should be changed or dropped. Before the end of 2001, he went overseas and the project was in wind-down mode as the infrastructure was in place. An agreement was made with EPD that in the absence of experienced monitoring consultants, our company would monitor itself. No conflict of interest there, then. As there were no other ecologists, I was asked to lead the team, which gave me the opportunity to look at all the previous years’ monitoring data. When I say ‘all’, there were gaps where no data had been collected, so either the birds, crabs and worms had all disappeared for months at a time, or the subconsultants had been taking money without doing any work. And all of this had gone unremarked by the authorities…for years. The data I collected with my team for the next year was comprehensive (and very interesting work) and showed great seasonal variation as the migratory birds passed through Inner Deep Bay twice a year. It was fascinating stuff and had it all been surveyed as intensively as the last two years could have been the basis for information boards at the Wetland Park if anyone had taken any interest. But taken as a whole, the entire data showed just how unimportant ecology is to Hong Kong’s progress. The story doesn’t end there. Ultimately, the project became HK’s Millennium Project gaining a lot more publicity than the infrastructure. Anson Chan opened the first phase of the Wetland Park and the consultancy was awarded a prize for environmental innovation. Not one member of the environmental team was taken by the consultancy to receive or observe the prize giving, that honour was taken by the (now) Project Director who had been so reluctant about wetland mitigation years earlier. Amusingly, he left the company not too long after receiving the award and his updated CV headlined his environmental credentials. Funny, that! I have been working on a report about how conservation and tourism at the HKWetland Park might have conflicts on certain aspects. It would be incredible if I can contact you through email/other messaging platforms or even meet for a small talk around this. Dates and time are up to you, thank you very much.